DEA: My husband Bob, and I own a home in Canyon Lake, Texas. We will be retiring to our Coulee City, Washington Ranch when Bob Retires. Our son, Andrew Freiheit, and his wife, Kirsten Wegel-Freiheit are both attorneys and live in Miami. Bob and I have been married since 1980. Like Bob and myself, Andrew graduated from the University of Washington. To the left is one of Andrew’s High School graduation pictures. With him is his best buddy, Cody, our Australian Shepherd. Cody passed away at 15 years of age. We got Cody when he was 6 years old from the Humane Society. He had been there for a month and his days were numbered. We miss Cody very much, but know he had a good life with us. 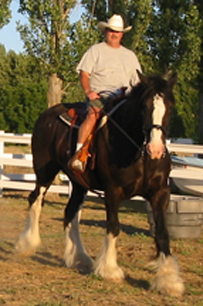 Bob is taking a ride on one of our horses, Marshall. If Marshall seems like a big horse, he was. He is an 18 hand Shire. This makes Marshall 62” at the shoulder! We were saddened when Marshall passed away at the old age of 26. We miss him very much. When I was 9 years old, I talked my parents into taking me to the Seattle Kennel Club show to see the sheepdogs. I saw sheepdogs from Cheerio, Cotswold and Squarecote, and even then I appreciated their quality. I wanted to get a sheepdog, but I had to earn the money myself. Between ironing my dad’s shirts and baby sitting, I finally had saved enough money. My dad and I went to see a litter but the puppies were being kept in rabbit hutches! 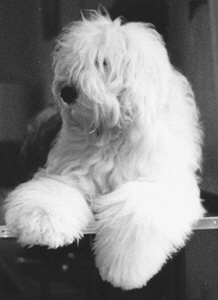 I knew enough even at 13 years of age to know that I wanted to wait and get a “real” sheepdog when I could find a puppy from a reputable breeder. I could not find an OES puppy at that time so instead, I got a German Shepherd/Standard Poodle puppy from the pound, and saved my money for college. Jaimie was an incredibly smart dog, and I went to countless obedience training classes with him. Eventually he mastered the advanced Companion Dog Excellent (CDX) level in obedience. He lived with my dad when I went off to college, and I cuddled and played with him every time I came home! 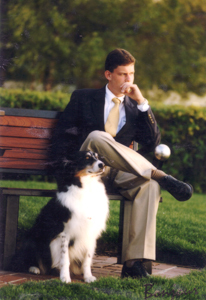 Jaimie taught me so much, and all of my experiences with him helped prepare me to be a better OES owner and breeder. Much of the advice I give new puppy owners goes back to lessons I learned from Jaimie. The above picture was taken in December, 1979. Bob and I had just graduated from the UW and were both working as Fisheries Biologists. Our wedding was still 4 months away, but we had our dogs!! I have Jaimie with me on the left and Bob has Molly with him on the right. This is shortly after we got Molly, who came to us freshly shaved. She was a year old when we got her. but we just called her Molly. Our son Andrew says “Dad, you knew about mom’s love affair with OES and you still married her?” Yes, it is true. Not only do I love OES, but I have had a passion for all animals as long as I can remember. I have had nearly every kind of pet you can imagine - just ask Bob! I groomed and handled Molly to her championship in 1980. It has been a love affair ever since. I showed several dogs under our old kennel prefix “Barclay” but at the start of 2006, I decided to join Colleen at SnowDowne. 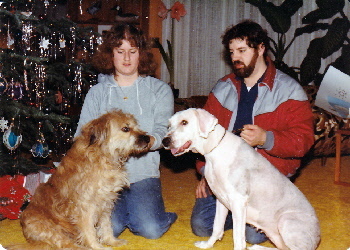 I was a member of the Old English Sheepdog Club of Greater Seattle since 1979. I have served as Secretary and President. I also served as the Editor of the Raggedy Ramblings, OESCGS’ magazine from 2005 to 2010. 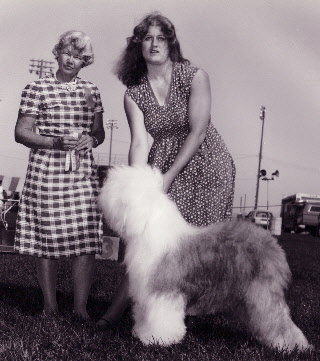 I am a long time member of the Old English Sheepdog Club of America (1981). I was awarded 2006 OESCA Member of the Year, which was a huge honor for me. This was due to the work I did as the Editor of OESCA’s 2002-2005 Yearbook. I also served as the Chair of OESCA’s Health & Research Committee for over 8 years. 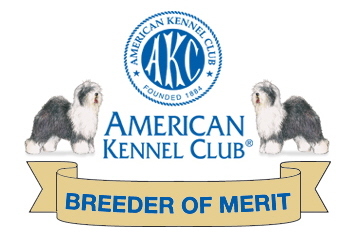 I previously have been a member of the all breed club Puyallup Valley Dog Fanciers, although I am no longer a member. I have decided to concentrate on our local and national breed clubs instead. When I was a member of PVDF, I served as Secretary and also as a Board Member.